This sophisticated drawer chest perfectly embodies traditional design. 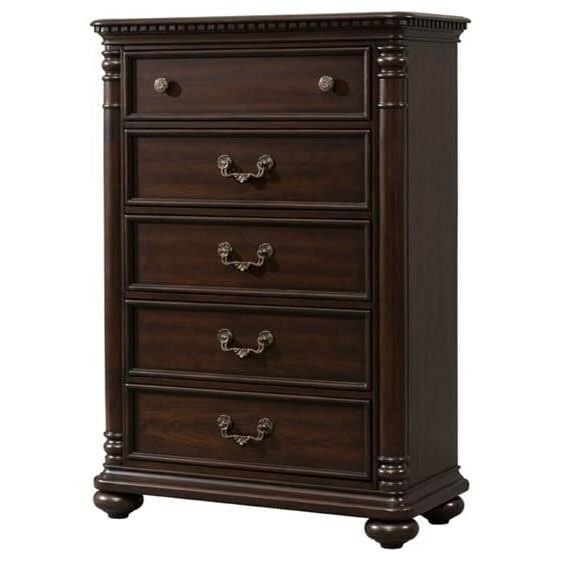 The chest features elegant traditional design details such as bun, feet, dentil and crown molding, and inset drawer panels. Adding to the refined style is a rich espresso finish. The drawers are sturdily constructed with dovetails and ball bearing drawer glides. Pair with the regal bed from this collection for a matching bedroom group. The Classic Traditional Five Drawer Chest by Elements International at Miskelly Furniture in the Jackson, Pearl, Madison, Ridgeland, Flowood Mississippi area. Product availability may vary. Contact us for the most current availability on this product.